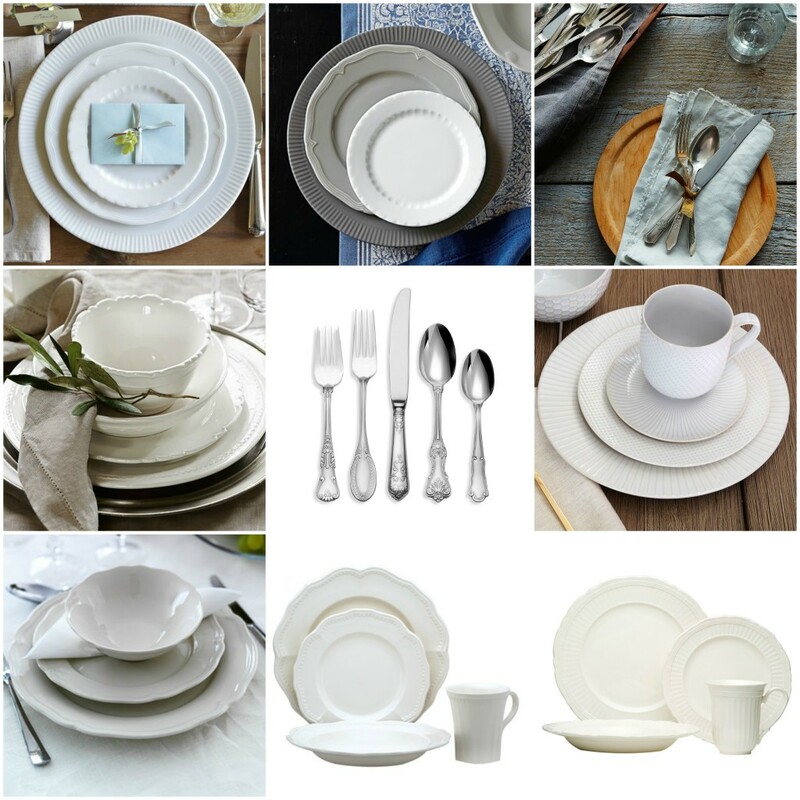 I’ve noticed so many trends popping up as I research dinnerware and flatware for our wedding registry – colors, textures, levels of formality oh my! One of my favorite trends is a mix-and-match of traditional shapes in a tight, modern palette. Now, I might not choose this particular look for the registry, our style tends to be a little more modern and minimalist, but it is so lovely to dream up eclectic, elegant tablescapes for imaginary parties! As always, there are some very high-end examples that would break any bank, some more affordable big-box or high-street takes on the trend, and my favorite – time-consuming but very wallet-friendly thrifted or self-assembled options. First two: On the high end of the dinnerware spectrum is the iconic porcelain Pillivuyt Eclectique collection, available at Williams Sonoma in white and shades of grey (shown on their stunning Hand of Miriam Runner, which would be very welcome on my table, if you catch my drift). It is luminous and truly gorgeous – whimsical scalloped bread and butter plates get me every time! Vintage silverware brings welcome gravitas to any table. Food52 have some lovely mismatched sets, and you can find similar items on etsy or in your local antique stores. Pottery Barn’s Italian Napoli stoneware collection is pretty and rustic. I particularly love that there is a real soup bowl (rather than a soup plate) AND a deeper cereal bowl. This flatware set from Wallace (available at Bed Bath and Beyond, hurrah for coupons!) does all the hard work for you, bringing together five of their classic flatware designs together in one match, mismatched set for twelve! West Elm’s Textured dinnerware consists of modern shapes and textures – it is a nice way to incorporate this look without sacrificing a more coupe-inclined esthetic. Ikea’s Arv line offers traditional plate and bowl shapes in white and grey at very economical prices. These would stand in very nicely for the grey version of the Eclectique set. The last two items are from Overstock and serve to illustrate how I might go about building my very own mismatched set. I would look for the color, material, and general size to match up nicely. These two patterns from World Market might be a nice option and have the added bonus of being produced in the EU. In this case, both set are from the same company, made of the same material, and have complimentary shapes. I would use this approach at the thrift store to find white porcelain piece that might sit nicely with our existing set. Dena at ChaiandHome has a great post about how to approach thrifting such a set. And so, I move on to more registry deliberations… classic wine glasses or stemless? Rustic or elegant dinnerware? And, Lord help me, colors of Le Creuset. Agony!